About a dozen riders and 5 or 6 cars are all converging simultaneously at the carpool line as I walk up. We all get sorted out and the next car in line for me is . . . I can’t believe this!! It’s the same maniac in that little red Honda I rode in yesterday (see March 11 blog). There’s that damn mirror ball hanging above the dash. I tell the guy behind me I’m not taking the ride. “I rode in that car yesterday and the driver is dangerous!”. He just smiles and goes ahead and gets in. With the light traffic on Friday and the freeway wide open, he’s gonna have a ride he won’t forget. It gives me great pleasure to walk past the Honda to the next ride in line. It’s a bright blue Chrysler Cruiser. I’m in the back seat, next to a child’s car seat. 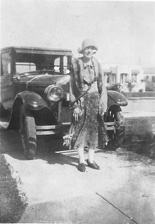 A young tired looking woman is at the wheel – same vintage fellow in front seat. He grabs hold of the handle above the door and doesn’t let go for the entire commute. Odd. KBLX Radio is on and is saying Daylight Savings Time is dangerous. This Saturday we set our clocks ahead and lose an hour. Numerous studies that have been done by sleep experts and psychologists have found that there are more heart attacks, work-related accidents, and traffic accidents (7% more) on the Monday following Daylight Savings Time! Most of us are sleep deprived to begin with and then we compound that when we turn our clocks forward by losing yet another hour. Besides being extra careful if you’re a driver next week, try to get to bed earlier on Sunday, get some morning sun on your face as early as you can. It helps to ‘reset’ your body’s clock. Worst thing to do is leap out of bed at the last minute and jump in your car. So listen up, my fellow commuters! Take care on Monday, and every other day, too, of course. It’s 7:16 as we round the curve by the marshes and my egret is standing in the middle of the pools, working away. He’s a gorgeous guy. The bay is a spectacular mix of dark clouds and golden patches where the sun is coming through. It’s Friday Light and the end of winter. Such a timely post (daylight saving kicking in) and a significant reminder to drive safely. With winter giving way to spring and summer eventually taking over, we are all going to start driving like crazy and keep driving. Just like a toddler who walks for the first time in life, and keeps doing it till tired and exhausted. We will go on vacations, run errands; take our cars, trucks, RVs and what not to the end of the continent and back. I, suggest that we all keep three things in mind. Drive less, drive safe and share a ride. Benefits: Save on gas (with prices ballooning), Save the planet (less emissions, clean air, healthy us), disconnect from stuff (ipods, cellphones, work) and connect with other living appliances aka people. Hi Jay! Thanks for the good comments. We commuters need to be reminded that we can make the magic happen by carpooling, car-sharing, and just generally using less stuff. Too many folks just keep burning it up like it will last forever.